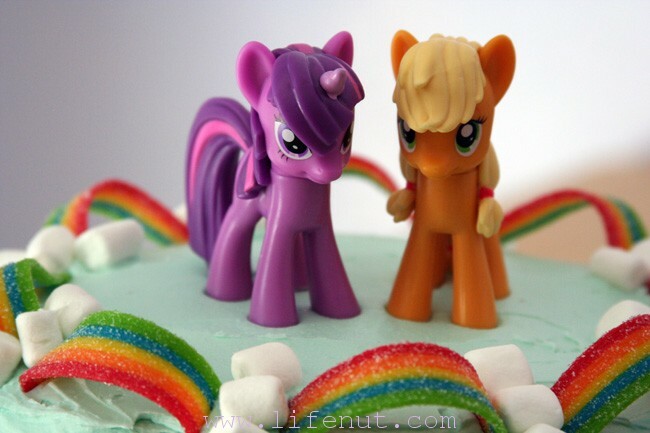 Ponies are from a place where rainbows rule. Last spring, I made these cupcakes. They were easy and so cute, I decided to revisit the theme. After frosting the two-layer cakes with baby blue tinted buttercream, I placed Airheads Xtremes Rainbow Berry strips around the outer edge, separated by mini marshmallows. I cut each strip in half, which was the perfect size for the arcs. Too short, they don’t arc well, too long, the frosting can’t support. I ended up with eight arcs. 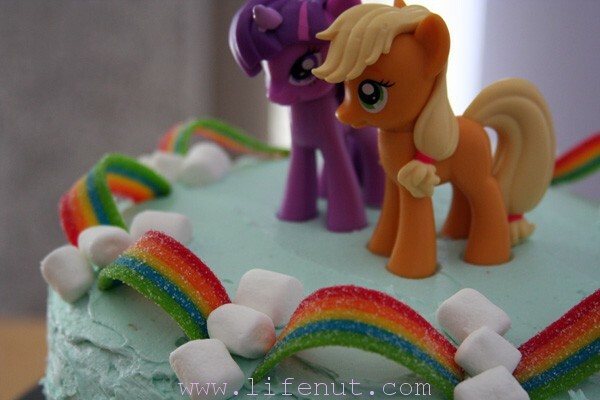 Pegasisters and Bronys, unite in the name of buttercream! Beatrix loved the cake. It’s one of my favorites, too, and it was so easy. You don’t have to be a cake decorating genius to pull it off. Ivy’s birthday is Sunday and I’m super tempted to make some cupcakes like this for her party! She’d love it. I love it! My daughter is very much into My Little Pony right now. In fact, her Dad knows all of their names and their cutie marks!